Ingredients: Water; Barley malt; Hop extract. 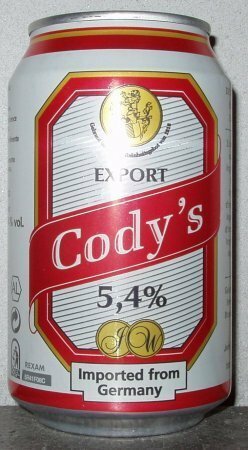 Brewed by Oettinger for Cody’s Drinks International, Bremen. 330ml can (IAlko1000, Ikla). Clear dark golden color. Small size, white head, stays. Metallic, malty, corn, papery in aroma. Metallic, paper, cardboard, clue in taste. Typical macro. 0,33l can shared by Marduk, thanks! A pretty run of the mill pale lager, has some maltiness. Can (thanks marduk). Pours golden. Aroma is grainy, malty, cardboard. Flavor follows the nose. Overall: bad. Horrible stuff. Turpentine and chemicals. Pours golden. Pasty kind of cloying aftertaste. Can in Malta. F: big, white, average retention. C: pale gold, hint of hazy. A: malt, grassy, hint of floral, caramel, touch of metallic. T: sweet malty, touch of grassy, caramel, metallic, hint of cardboard, medium body, medium carbonation, not good and not enjoyed, cheap (82c a can) and that´s all, 0,5l can from Chain foodstore in the Point Shopping Mall in Sliema. Clear golden beer with average white head. Enough grassy hops and a good malty body, but also an agressive bitter sweet component that I find unpleasant. Drinkable. Cannette 33 cl. Achetée au Burkina Faso. Blonde, claire, mousse mince blanche. Arôme de céréales léger et un peu de maïs. En bouche, malt léger, petit sucre en finale, peu de houblon. Pas impressionnant.